Your credit score is extremely important. Not only does your credit score allow you to secure low interest rates on car loans, credit cards, and mortgages, but it can also be a factor when you’re looking for apartments, or even a job. If your credit score isn’t where you want it to be, you’re not alone. A recent Credit Karma benchmark noted that the average FICO score in the United States is 700. While that may be a solid score for some, there’s still room for improvement, even at a 700. 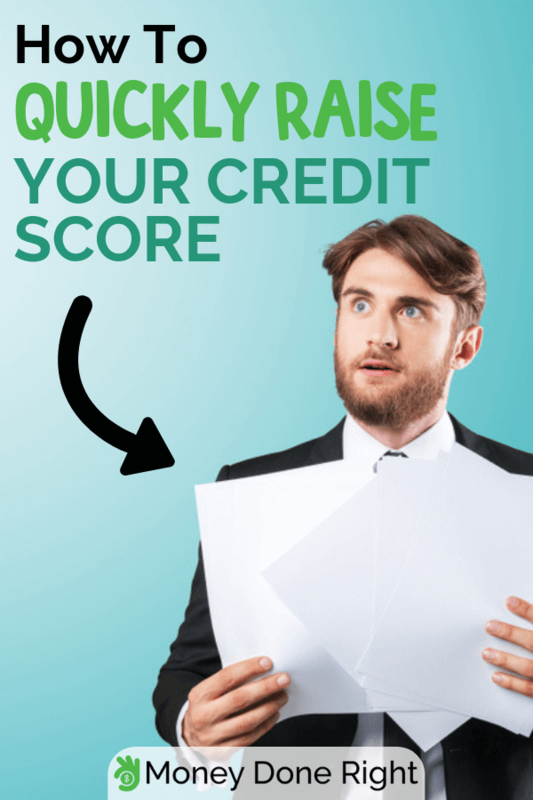 For those of you with scores in the 600’s, 500’s, and even lower, there are some strategies that you can use to improve your credit score quickly and keep it there. Building a substantial credit history does take time, but once you establish a plan for your credit and understand how your credit score works, there are steps that you can do to quickly boost your score and get your finances under control. In our guide, we’ll show you 17 unbeatable ways to improve your credit score in no time at all. Looking for a free tool to help you find out your credit score? Look no further – sign up for Credit Sesame today! As soon as a late payment is reported on your credit, your score is going to take a major hit. Paying your bills on time is one of the biggest single factors that impact your credit score, and if you’re delinquent on even one payment and it gets reported on your credit, it can cause big issues with your score. Typically, most creditors won’t report a late payment on your credit report unless the payment is beyond 60 or 90 days late. In some cases, it can be as long as 120 days late before it’s reported, although that is not typical. If you have a history of paying late, coming up with a simple payment strategy can actually raise your credit score quickly. Grab a calendar and write down when all of your bills are do so you can budget around your bill due dates. Apps like Trim or Cushion that can keep track of your bills and negotiate them on your behalf can also be very helpful. Paying your bills on time is one of the biggest factors that make up your credit score, and it’s also one of the easiest things you can do to raise your score. Simply paying your bills on time every month will do wonders for your credit score. Late payments have less of an impact over time, but do stay on your credit report for seven years. If you’ve been saving, you may want to put some of your savings toward paying off your existing debt. Depending on the interest rate of your debt, it’s often a smarter financial move to pay off debt rather than investing. While it’s often much easier said than done, reducing the amount of debt you have not only will increase your credit score, but it will give you motivation to keep going and eliminate debt completely. Assess your current debt by reviewing your credit report, then create a monthly calendar to track your debts, due dates, and amounts owed. Then write down when you get paid, how much you get paid, and how much you have left over after paying for living expenses and bills. If you’re able to, allocate some of your extra money toward paying off debt faster. You may need to adjust your lifestyle, but a short change in the way you spend money will be well worth it when your debt is reduced and your credit score increases. Click here for some additional reasons why paying down debt is so important. Paying down your existing balances is much easier when you’re making some additional income on the side. Paid surveys, reducing expenses, and even renting out an extra space in your home or apartment are just a few of the many ways that you can make extra money. There are tons of flexible side gigs that let you pick and choose when and where you want to work. Create a strict budget for all of your new income and stay diligent in using your extra money to pay off debt. It can be difficult to use extra income for debt, but staying focused on your long-term financial goals will give you the motivation to pay off your debt faster instead of using your extra income for other purchases. Need some ideas on how you can start earning money on the side? Check out our comprehensive list here. As a general rule, you should keep your credit card balance under 30% of your total credit limit. Whether you have one credit card or ten, always be mindful of not only your overall balance, but the balances on your individual cards. For example, if your total credit limit is $15,000, you should aim to keep your credit card balance at $4,500 or less. When you go over 30% of your total balance, that indicates riskier spending habits, which is a red flag for lenders. Not only is the total balance compared to your total limit considered when determining your credit score, but the number of cards that carry a balance plays an important role as well. It’s often better to use one card for your regular purchases rather than multiple cards that carry balances. Many consumers mistakenly believe that multiple cards with small balances is better than one card with a larger balance. If you’re someone that has small balances across a number of cards, it may be hurting your credit score. A simple way to boost your credit score quickly is to pay off your credit card debt so that it’s under 30% of your total limit. You should also pay off any cards with small balances and stick to one primary card for your purchases. Even paying off two to three cards with very small balances can give your credit score a nice boost. Click here for useful tips on how to find the best low interest rate credit cards for your needs! It’s always a good idea to shop around for the best interest rates, but you should only shop around at lenders if you’re serious about making a purchase. Some lenders require a hard credit inquiry even to pull initial rates and estimates. Hard credit inquiries hurt your credit, and although they only reduce your credit by just a few points, if you’re consistently having your credit pulled via hard inquiry, those credit dings can really start to add up. Fortunately, there are plenty of sites that now offer what is called a soft credit inquiry, or an inquiry that won’t impact your credit score. You can check mortgage rates, car loan rates, credit card rates, and more without having a lender hard pull your credit. A soft credit inquiry is a great way to shop around without committing to a lender, allowing you to get the best rate for your next loan or large purchase. Fortunately, if a lender does perform a hard inquiry, the small credit score drop won’t last long. Hard inquiries have less of an impact over time and are completely removed from your report after two years. If you’re having a hard time keeping up with your minimum payments, consider contacting your creditors to set up a payment plan. Many people may not realize that most creditors are often willing to work with you on creating a payment plan. After all, if you’re not paying your bills, they’re not getting their money, so there’s an incentive for them to help you out if you’re not able to keep up with the current payment arrangement. Remember, late payments can have big impacts on your credit score, and setting up a payment plan will help you make your payments on time. Consistent on-time payments build your credit and improve your score over time, so it’s absolutely worth contacting your creditor to try and work something out. It’s a common belief that old, unused credit accounts should be closed and removed from your credit report. If you’re not using it, won’t another account lower your credit score? Not necessarily. Closing unused accounts may actually harm your credit score rather than helping it. If you are closing a credit card account with a high credit limit, it can impact your overall credit utilization percentage. A credit utilization that is more than 30% will negatively impact your credit score, so closing an old credit card account while you still have an outstanding balance on another card will increase your credit utilization without you even spending any more money on your credit card. Some accounts, like car and home loans, will automatically close when the account is paid off. You’ll still have your excellent payment history and a record of the account on your credit report, meaning an automatic account closure won’t negatively impact your credit score. We all need a little help with our credit scores every now and again, and that’s where CreditSesame comes in. CreditSesame is a free tool that allows you to check your credit score at any time. You get free credit score updates every two weeks, meaning you can stay on top of any changes on your report. Signing up takes just a few minutes and is completely free. Once you set up your account, you’ll have access to the CreditSesame dashboard, where you can see your credit score, suggestions for improvement, and even a simulated credit score showing what your score could be after completing the suggested actions. The tips are personalized to your credit profile, so take advantage of the suggestions and use the CreditSesame resources to raise your credit score quickly. You’ll get an in-depth overview of your credit report, recommendations for financial products based on your credit profile, and a thorough database of credit and financial management resources at your disposal, all for free. Take control of your credit score by signing up for CreditSesame today. Similar to CreditSesame, Credit Karma is a leading platform that allows users to review both their Transunion and Equifax credit scores and reports, all for free. The snapshot dashboard gives you a quick overview of your current scores, and when you click on one of your scores, you’ll be able to see a detailed breakdown of your accounts, balances, and more. In addition to a detailed breakdown of your credit report, you have the chance to dispute errors directly on Credit Karma. Credit report errors are much more common than you may think, so it’s a good idea to regularly review your report for any issues. Removing errors from your report can boost your credit score in no time. Credit Karma also makes personalized recommendations based on your credit profile, including credit cards, personal loans, auto loans, mortgages, and more. You can even file your tax return right through the Credit Karma app or website. Credit Karma is a fantastic tool that will allow you to understand your credit and create an action plan to raise your score and take control of your finances. Review your credit score and get personalized recommendations by signing up for Credit Karma. Personal Capital is a leading financial app that allows you to take control of your financial situation all in one easy to use dashboard. Using financial tools developed by leading financial experts, you can get in-depth information on your personal financial picture. Set multiple savings goals, analyze your retirement account, and track your spending through the Personal Capital app, all for free. Personal Capital can also help you improve your credit score. When you link your accounts, such as your bank account, credit card account, and loan accounts, you’ll get personalized recommendations on managing your money to pay off debt faster and improve your credit score. In addition to industry-leading resources and tools, Personal Capital also serves as a financial management company, offering personalized portfolio management and full financial planning services. Personal Capital currently manages over $8 billion in assets and provides financial management services to over 18,000 clients. Sign up for Personal Capital today to get expert tips and tricks on boosting your credit score and managing your finances. Join today to get a $20 signup bonus. Nerd Wallet gives users expert tools, resources, and recommendations, all for free. Learn about credit management, read how-to articles, and browse top financial product offers all through the Nerd Wallet site. Nerd Wallet is a comprehensive resource for your financial questions. You can quickly compare credit cards, online financial management companies, personal loans, mortgages, savings accounts, and more to find exactly what you need. When you’re searching for a new credit card, home loan, or personal loan, simply enter your credit score range and what you care about most when it comes to borrowing money. Nerd Wallet will match you with the right financial products based on your answers and will give you all the information you may need to make the right financial decision. If you’re interested in raising your credit score, Nerd Wallet can match you with products that can lower your interest, increase your credit line, or consolidate your debt, giving you the tools, resources, and motivation to boost your credit score. Take advantage of free resources and advice by signing up for Nerd Wallet today. Creating a budget and sticking to it is one of the best ways to drastically improve your credit score. When you create a budget, it means you’ll start making payments on time and may in fact have extra money to allocate toward paying off debt faster. There are tons of apps that you can use to start managing your money wisely. Get personalized tips, review your current debt and cash flow, and create a monthly budget right on your phone. To get your family involved in saving money and spending wisely, create a calendar that you can all use at home. When you get your family on board with saving money, you’ll have the motivation to make smarter money decisions. Before you commit to making a large purchase, you should always shop around for the best interest rates. Fortunately, you often have a grace period that allows you to get multiple quotes from lenders without hurting your credit score with each hard inquiry. Typically, credit bureaus will deduct a few points from your credit score after the initial hard inquiry, and any additional inquiries within the grace period will have no impact. This period will allow you to speak with multiple lenders in order to get the lowest interest rate without negatively impacting your credit score. As we mentioned previously, you should only have a lender pull a hard credit inquiry if you’re serious about making the purchase, otherwise, you’re impacting your credit score for no reason. Shopping around to get the best interest rate may raise your credit score quickly if you’re approved for the loan and start out strong making on-time payments. Large purchases require adequate planning and saving. Cars and homes often have large up-front costs that inexperienced lenders may not be prepared for. Going into any major purchase without planning can hurt your credit score and leave you without a loan approval, meaning you missed out on your big purchase. One of the top ways to prepare for a large purchase is to simply save up as much money as you can to put toward the purchase. The less you finance, the easier it will be to pay off the loan, and the lower your monthly payments will be. Paying on time is obviously easier when monthly payments are lower, and when you successfully pay off an installment loan, your credit score is going to be much better for it. In addition to a lower monthly payment and better financial management, you may be able to secure a lower interest rate if you have a larger down payment, which reduces the total amount owed over the life of the loan. Saving up for a substantial down payment can be difficult, but there are tons of ways to make money on the side in your spare time. Click here for more useful tips and tools to help you pay off your debt faster and earn financial independence! A recent report showed that as many as 20% of consumers have some form of error on their credit reports. Errors can negatively impact your score and make you seem riskier to lenders than you actually are, which may result in being turned down for financing. Whether you check your credit report through a site like Credit Karma or CreditSesame, or you use your once-yearly free credit report directly from the credit bureaus, you should thoroughly review your report for any inaccuracies. Incorrect payment reporting, past due accounts, collections accounts that don’t belong to you, and incorrect credit card balances are some of the most common credit report errors. Fortunately, both Transunion and Equifax have a relatively simply dispute tool that allows you to contest any errors and inaccuracies on your report. Once you submit a dispute, the claim is investigated and the error is removed from your report if it is found to be an error. The entire dispute process is relatively quick, meaning you can improve your score very quickly by disputing something that shouldn’t be on there in the first place. Having a high credit card balance with an interest rate over 20% can make it extremely difficult to pay off that balance. Unless you have a significant amount of money saved up to take care of the balance all at once, you could end up paying off your credit card for years to come. If you’re able to, pay more than the minimum payment each month to help tackle some of your credit card balance. If you don’t have extra cash to put toward debt, you may want to consider refinancing that debt to secure a lower interest rate. Personal loans are a great way to consolidate your credit card debt and pay a much lower interest rate than you’d see on a credit card. If your credit is good enough, there are personal loan companies out there offering rates as low as 4%. By restructuring your debt into an installment loan with low interest, you can boost your credit score and get your debt paid off much faster. Managing your credit is a skill that has to be learned, and with so many free resources out there, all it takes is a quick internet search to start learning about how to successfully manage your credit and finances. When you research and learn about credit management, you can put those tips and tricks into practice. Sites like Credit Karma and CreditSesame have excellent databases of credit management information, as does Personal Capital and Nerd Wallet. Building your credit score often takes time, effort, and patience, but when you partner smart financial management with proven methods to raise your score quickly, you can raise your score and use your new credit management knowledge to keep it there. At the end of the day, you should focus on making on-time payments and reducing your overall debt balance. Unless you’re about to make a major purchase, such as a car or a home, you shouldn’t stress too much about your credit score. While there are tactics that you can use to quickly raise your credit score if needed, the best ways to have a meaningful impact on your credit score often happen over time. Length of credit history, payment history, number of inquiries, and overall debt balance are the biggest factors when it comes to determining your credit score. Most of those factors simply take time, so when you create a budget, stick to it, and avoid increasing your debt, you’ll see your credit score increase in no time. We love credit score success stories and we’d love to hear yours. Have more tips on how you can quickly raise your credit score, or do you have a credit score success story? Let us know in the comments! Want even more ways to manage your money and boost your credit score? Check out some of our top recommendations.